We originally posted this in October of last year...but we think it deserves another look. Everybody knows that they need to or should recycle. All that being true, the word recycle seems to only make people conscious of plastics, bottles and paper. When you stop and think, you really can find alternate uses for almost anything, that is if you are creative enough. The minds behind Recycled Brooklyn have taken some very used items, and re-purposed them into stylish furniture of all things...how's that for creative? 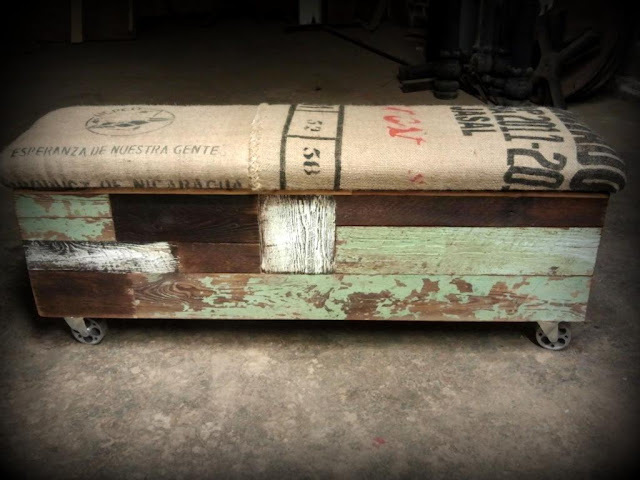 Take the coffee sack storage bench on industrial casters pictured above, made from reclaimed wood and used burlap coffee sacks. It has a great patina, and the coffee sack theme would be perfect in the dining room. It's far better than being thrown away, or chipped into sawdust, and you have a piece of furniture in your home that has a history...and most likely a history that is far removed from the realm of home furnishings. You can learn more here.